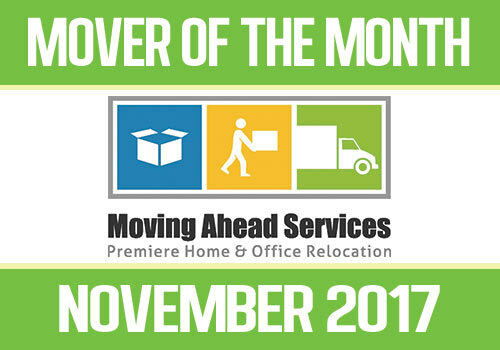 It has been a busy year in Columbus and we are excited to announce that we are wrapping up the year with the Mover of the Month Award from Move for Hunger! 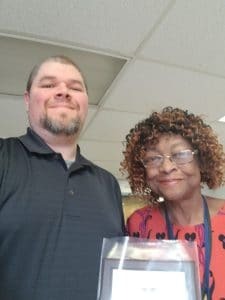 From our very own food drive to assisting other local organizations with the logistics of their food drive, we are happy to be a part of fighting hunger in our community. We are also proud and grateful to have received a plaque presented by Leadership Excellence! In September, Leadership Excellence hosted a great food drive that involved 5 local schools. They needed supplies and transportation help, and Move for Hunger knew who to call! Their food drive collected 600 pounds of food, over 500 meals for those in need! 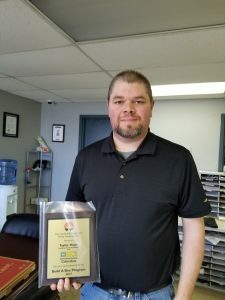 Move for Hunger is a program for Moving Companies to collect donations from customers that would otherwise likely be heading to the trash on moving day. Unfortunately, moving day often means that items in your pantry that you no longer want or need to move, get tossed aside. As part of the Move for Hunger program we provide a box or boxes and allow customers to fill them with donations. On moving day, we collect the items and then donate them to local organizations like the Dublin Food Pantry. Move for Hunger has also evolved over the years for non-relocation companies to get involved as well! Most recently, we assisted Leadership Experience and McKesson Corporation in their food drives. 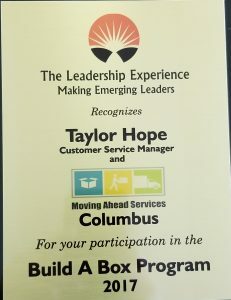 To date, Moving Ahead Services Columbus has collected 2,500 pounds of food – over 2,000 meals for those in need! Read the full article here, including an interview from our very own Taylor Hope! We are grateful for our hard working teams and generous customers in Columbus! Thank YOU!